Global museums that include well-endowed cultural institutions located in major cities such as NYC, Los Angeles, Tokyo, Shanghai, and London have the power to use data analytics to grow their revenue and respond to audience trends. Many have annual budgets starting at $100M and use their resources to take full advantage of data analytics to generate insights for their visitors, change their admission pricing, or to predict visitor attendance based on factors ranging from weather, public school schedules, and tourism events. While these global museums might have more resources at their disposal, smaller museums can benefit from big data by learning more about the power of data analytics and using simple best practices to make data-driven marketing decisions. Just as retail and e-commerce businesses analyze data to support product development and improve customer experiences, so can museums. 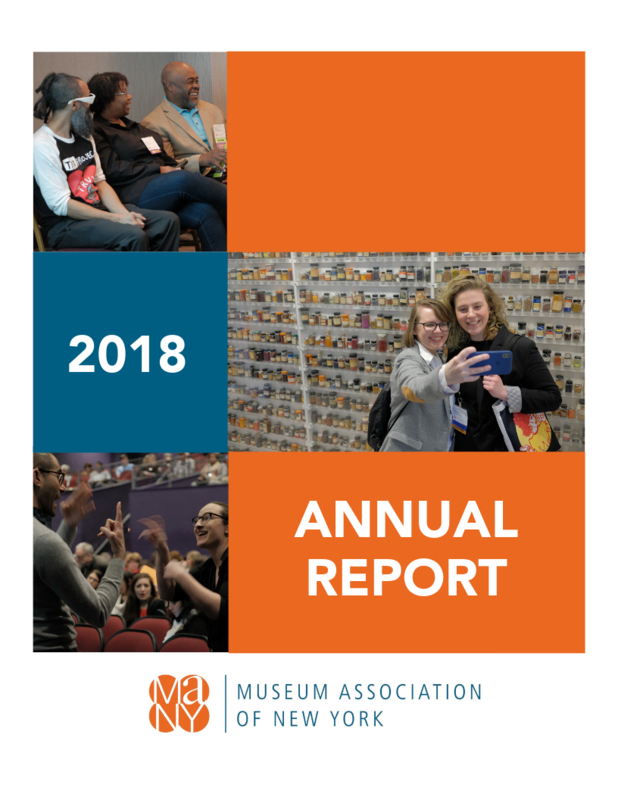 By looking at audience demographics, spending habits, location, and more, museums can make better marketing or programming decisions to increase attendance and revenue as well as diversify visitors. Understanding current or future target audiences can affect admission, exhibit development, membership structure, museum shop items, and more. By using Google Analytics, MANY has seen an increase in website visits through our LinkedIn page. This accounts for nearly 20% of all social media referrals to our website in the past three months. We were able to correlate this data to the increase in pageviews to the MANY Job Board webpage as one of the top reporting pages. We analyzed LinkedIn’s insights and discovered that the impressions for job board related posts yielded an average higher impression rate than other posts. This data has helped MANY understand that by using LinkedIn to promote the Job Board we increased LinkedIn’s social media referrals to our MANY Job Board webpage. After the MANY homepage, the MANY Job Board page is now the second most visited landing page because of social media acquisition, specifically LinkedIn. All Social media platforms have their own built-in analytics and insights that can measure post and event engagement rates, reach, impressions, and click-throughs. Museums can see audience demographics, popular posting times, and user locations. Data captured by social media insights can also be used to clearly share the results of a marketing campaign. By creating a data report, museums can highlight the connection between an event ticket sale and online click ads. Facebook and Instagram ads let museums dictate target audiences, either based on current demographics, or by expanding and diversifying by location and interests. Platforms like Facebook can help museums make better marketing decisions and plan targeted audience campaigns. Many smaller museums struggle with audience engagement and community relevancy, using data to evaluate audiences, programming, events, and exhibitions is an important resource to increase audience growth and engagement. Kwasi believes that smaller museums can advance by building a data-driven culture to develop new audiences and remain publicly relevant. Museum on Main Street has been part of the Smithsonian Institution Traveling Exhibition service visiting communities across the United States since 1994. Its exhibitions have traveled to 48 states, have been hosted by over 1,400 communities, and are used to kick-start local exhibitions and programming. These exhibitions are specifically designed for smaller museums in rural communities with an average population of just over 14,000. After visiting just about every state, Museum on Main Street or MoMS is making its New York State debut with Water/Ways starting this June and ending in April, 2020 as it travels across the state to six different communities. Water/Ways began in 2016 and dives into water as an essential component of life on our planet; environmentally, culturally, and historically. This exhibition takes a deep look at water’s impact on our lives, how it powers the environment, impacts climate, and how it physically shapes and sculpts the landscape around us. Water/Ways asks how Americans use water, how is water represented in our society, how do we use water a symbol, how does water unite communities, and how does water affect the way we live, work, worship, create and play? These questions are addressed over five free-standing exhibition panels that feature photographs, text, and objects, with one video monitor, two touch screen interactive computer kiosks, and an iPad-based WaterSim American interactive on a stand. Water/Ways has travelled to states like Florida, Illinois, South Carolina, Arizona, Washington, Oklahoma, and is now it is en route to New York State. It seems rather fitting that the first MoMS exhibit in New York State is Water/Ways. New York has more than 7,600 freshwater lakes, ponds, and reservoirs, as well as portions of two Great Lakes and over 70,000 miles of rivers and streams flow within New York’s boundaries. Water has created communities, and economic power like the Erie Canal’s 363 miles that gave New York City’s port an incomparable advantage over all other U.S. port cities and guided the state’s 19th century political and cultural dominance. 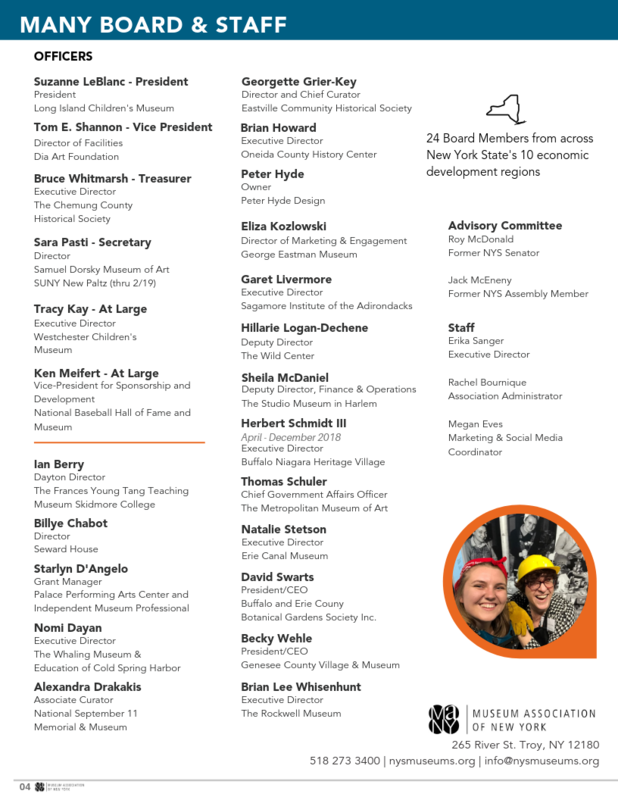 Water/Ways will travel across New York to six different communities to share stories of how their waterways contributed to their growth, development, and connection. 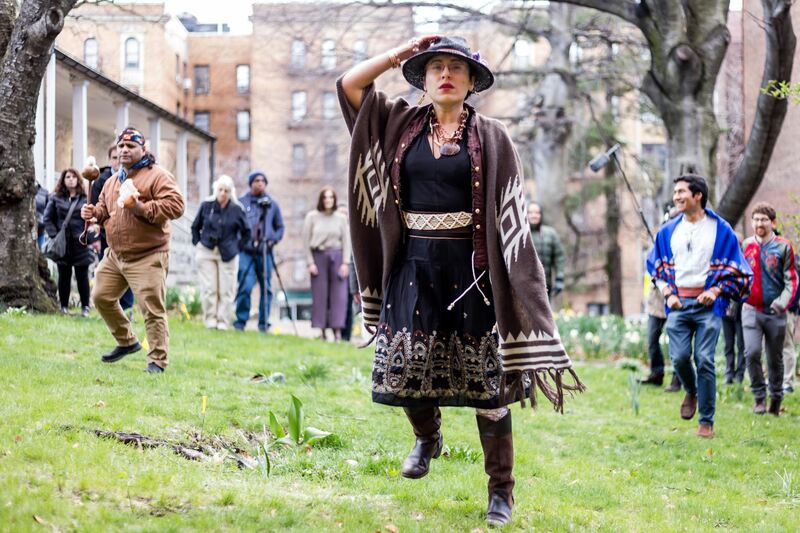 To deepen the connection that water has to our communities, MANY is partnering with the New York Folklore Society who will help capture oral stories and histories by offering partnerships with folklorists. These folklorists will work to help capture stories about waters’ deeper connection spiritually and culturally to these communities. These oral histories and stories about water and its effect on life, work, spirituality will help each of the six host communities further create a unique exhibition alongside the Smithsonian’s that will tie larger, more national ideas and concepts to a personal and local level. Starting this June, Water/Ways will mark the Bicentennial of the Erie Canal with its first stop at the Erie Canal Museum. Showcasing the only remaining canal weighlock building in the United States, the Erie Canal Museum in Syracuse, New York collects and preserves Canal material, and provides educational experiences that champion an appreciation and understanding of the Erie Canal's transforming effects on the past, present, and future. The Museum is located directly adjacent to the route of the original Erie Canal, which transported goods, people, and ideas across New York State and into the Midwest and was known as the "Mother of Cities" due to its enormous impact on the growth and development of communities including Syracuse, Rochester, Buffalo, Cleveland, and Chicago. Their Water/Ways programs will help improve the public’s understanding of technology and engineering related to water, how the Canal affects the natural position of water for different purposes, how it manages water, and how it transported people, goods, and ideas. Opportunities to see Water/Ways will continue as the exhibition moves around the state from the Village of Aurora in the Finger Lakes, along the Erie Canal to the Buffalo Niagara Heritage Village, the Chapman Museum in Glens Falls, the Hudson River Maritime Museum, and ending at the East Hampton Historical Society on the eastern tip of Long Island. Each host site will expand on the Water/Ways exhibit to incorporate direct links between water and its impact on their community. In the Village of Aurora, a partnership between the Aurora Masonic Center, the Village of Aurora Historical Society, and Long Library at Wells College has formed to share their unique water stories that surround Cayuga Lake. Cayuga Lake is the longest of the Finger Lakes in Central New York. Since the withdrawal of the glaciers, the lake has provided important resources to dwellers on and near its shores, from paleo-Indian hunters to the Cayuga people of the Haudenosaunee whose orchards and village, “Peachtown,” was here before the Revolutionary War. By 1789 and the arrival of the Euro-American settlements in this area, the unique climate provided by Cayuga Lake led to the rapid growth of wealth from the land and lake shipping thrived. The Erie Canal brought Aurora’s wool, grain, and fruit to national and world markets. These advancements have contributed to the Aurora we know today as a dual Village of Aurora and Wells College National Historic District, as well as a tourist destination in the Finger Lakes. Like other communities throughout the Finger Lakes, farming is a significant part of the economy and water quality remains an ongoing issue. All of which will be explored during their Water/Ways exhibitions and programming. The Buffalo Niagara Heritage Village in the Western Region of New York State, is located at the confluence of the original Erie Canal and Tonawanda Creek. BNHV will use Water/Ways to further connect their community by inviting residents to share their family’s own water story and contribute photographs, stories, and other memorabilia. Their upcoming Farm to Table exhibit will highlight the impact of local water resources, including the Erie Canal, local bodies of water, and Niagara Falls, on agriculture and local ways of life. Water has been an important factor in the history surrounding the area of the Chapman Historical Museum. Its rivers and lakes offered transportation for armies during the French & Indian War and during the American Revolution. The Hudson River provided water power for the lumber and paper industries, and later, the generation of electricity. During the Water/Ways exhibition, the Chapman Historical Museum will present multidisciplinary programs that deal with three key waterways in the region around Glens Falls: The Hudson River, The Champlain Canal and the Lake George/Champlain watershed. These waterways are crucial to the region, providing drinking water for municipalities and serving as the main attraction for tourism. Located on the historic Rondout Creek, the Hudson River Maritime Museum collects and displays four centuries of technological, industrial, and ecological innovations in the Mid-Hudson Valley. Kingston’s location, halfway between Albany and New York City, allowed the city to flourish during the time when coal was the dominant fuel source in use. Steamboat transportation and commercial fishing expanded simultaneously, and the Rondout Creek thrived as an economic driver and premier tourist attraction for the Mid-Hudson Valley. East Hampton Town, the home to the East Hampton Historical Society, is fundamentally linked to water and its power to move and sustain people. The East Hampton Historical Society documents the history of the bay-men and fishermen who lived and worked on the water for decades- clamming, fishing, and whaling. The East Hampton Historical Society focuses on the rich history of Native Americans using and honoring the waterways long before European settlement, and eventually teaching Europeans successful methods of whaling and how to navigate the waters in canoes. Today, East Hampton is defined by its proximity to the ocean. It's location as a tourist destination and a residential area allows them to expand education about the importance of waterways, teaching the next generation about pollution and conservation. The Museum Association of New York is working with OnCell to create an exclusive New York Water/Ways app where you can learn more about each host site, their specific interpretations, programs, images, videos and more. The arrival of the Smithsonian’s Museum on Main Street exhibition to New York State not only marks the first MoMS exhibition for New York, but opens the door for future MoMS exhibitions and further collaborations and partnerships between the Museum Association of New York and museums. It has created and expanded partnerships with the Erie Canalway Heritage Corridor, the Hudson River National Heritage Association, and the New York Folklore Society. 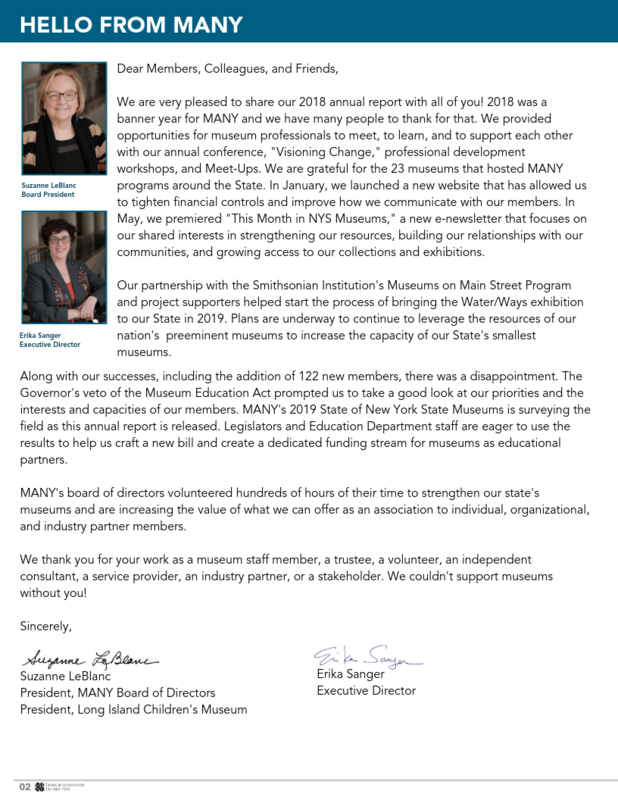 The Museum Association of New York is incredibly excited to finally have MoMS travel to New York State bringing the Smithsonian outreach program to help engage our museums and their communities and amplify our museums. Find out more information and start planning your New York State Water/Ways experience with the links below. The “Museums are not neutral” movement emboldens museums to take a stand, choose a side, and take action. For most museums, this means choosing to stand for something in their communities, usually a social issue, and taking action to be part of the conversation for change. In 2016, the Rochester Preservation Board voted unanimously to remove an offensive painted panel from the historic Dentzel Carousel at Ontario Beach Park and entrust its stewardship to the Rochester Museum & Science Center (RMSC). The City of Rochester selected RMSC as a partner in the process based on the organization’s long-term commitment to preserve, study, and interpret regional history objects and the staff’s technical expertise in exhibit development and fabrication. But the Preservation Board meeting was also the first time that RMSC staff heard African American community members express concern that a European-led institution was ill-equipped to deliver anti-racist education. Since its opening in 1912 as the Rochester Municipal Museum, the RMSC has been a community museum. Part of RMSC’s future and vision is to “create opportunities for community conservations around difficult issues.” Difficult conversations, around objects like this racist carousel panel, are important bridges between museums and their communities in the continued efforts to remain relevant and connect to current events in society. The Take It Down Planning Committee struggled to remove this offensive panel for nine months, revealing underlying racial tensions in the Rochester community. When the same activists who agitated for the panel’s removal called out the RMSC’s lack of leadership diversty as a barrier to creating honest exhibits and programs around racism, the RMSC vowed to develop a more authentic model for community collaboration and curation. This work in partnership with the Take It Down Planning Committee and City of Rochester transformed a racist caricature into an anti-racist teaching tool, created important opportunities for dialogue around issues of racism in Rochester, urged RMSC to examine its own policies and practices, and earned the RMSC a 2019 MANY Engaging Communities Award of Merit. Collaboration with the Take It Down Planning Committee—and especially the leadership of Howard Eagle, Andria Bryant, and Minister Clifford Florence—was critical to the project’s success. Their dedication was integral in bringing the exhibit to life and challenging the Rochester community to examine the ways in which structural racism influence and inform institutional norms and individual behaviors. Together, community activists and the RMSC tackled a difficult and highly relevant topic, used an historic object to help illustrate the issues that modern Rochester society is facing, and developed a process to create and host conversations among community members, across class, and across race. The group ensured that Take It Down traveled to locations throughout the city so that the community had opportunities to not only see the panel but also to take ownership of the conversations it was creating. This traveling exhibition has visited six locations—from churches to the Phillis Wheatley Community Library—to date and averages four exhibition sites per year. It is currently back on display at the RMSC. There are usually two programs at each exhibit site totaling about 25 programs thus far that have engaged an estimated 300-500 people. Each program is led by Take It Down Planning Committee members in partnership with RMSC and is offered for free to the public at each venue. “Since every audience is unique in its composition, I would say that the conversation has organically led to discussion of many different racism-related issues and potential (baby step) solutions. I have noticed many faith communities taking the initiative to open these conversations and there has been a lot of interest in the museum community,” said Kathryn Murano Santos, Senior Director of Collections and Exhibitions at RMSC. She notes that the project team has given presentations to area docent groups, students and educators in the Cooperstown Graduate Program, and MANY 2018 Conference Capstone participants. In conjunction with the Take It Down Planning Committee, RMSC has also been able to offer the program as a credited professional development opportunity for teachers in the Rochester City School District and is currently working with the Rochester City School District to engage middle school and high school students in the program. In an era defined by widespread political unrest, factionalism, and increased racial tension (based largely on continued racist abuse and atrocities), this project is extremely topical. Structural, institutional and individual racism continue to reduce opportunities for a large portion of the population, create barriers between community members, and serve as antagonists to racial progress and a feeling of community pride. Take It Down works to further racial equity and by engaging the community in real conversations about race, and what individuals and organizations can do to combat racism, with community activists who have worked toward social justice for decades. RMSC’s role in fostering positive change has focused on providing technical expertise to further a community-based vision for anti-racist education. Importantly, this work has moved the RMSC toward a model for more authentic community collaboration, including shared authority and decision-making. The RMSC is embracing these changes to be more socially engaged, relevant, and responsive to the community it serves. As more museums talk about what their roles should be in their communities as they work to remain relevant, asking questions about neutrality surrounding difficult conversations can challenge museums to ask what it means to not be neutral. Each and every time I attend an event where groups of museum people come together, I learn something new. In Cooperstown, I learned about how the museum field is changing, how we iterate faster as technology expands our reach, and how, when facing challenges, if we work together we can reach new levels of excellence. I am also struck by the ways in which MANY is changing because who joins us at the table has changed. John Duane Kingsley, Zach N Bowman, and Danielle Bennett filled a room passed capacity for the panel discussion “The Present is Queer: Case Studies & Strategies for LGBTQ+ Representation in US Museums.” On his travels home, John wrote a Facebook post in which he shared, “Having attended MANY conferences in the past, the conference had largely served as an echo chamber for the same institutions and voices. It did a wonderful job of connecting small museums and empowering them with tools to maintain their operations but did little to challenge the status quo. This year’s conference changed that mode entirely.” MANY does not exist in a small room in Troy that overlooks the Hudson River, we exist in the places graced by the energy people bring and what and how they share. At this year’s annual conference the weather smiled on us, we had a beautiful place to gather, and generous host museums to welcome us. If you were among the 446 museum professionals who joined us in Cooperstown, thank you for the journey, your time, and your expertise. Planning has already begun for “The Power of Partnership,” our 2020 annual conference. Downtown Albany will roll out the red carpet for us and members of the local planning committee are cooking up unique experiences that showcase how partnering institutions create a cultural community together. With the help of those who have taken our 2019 survey of the field, I have learned that what we know about our members and colleagues is also changing. 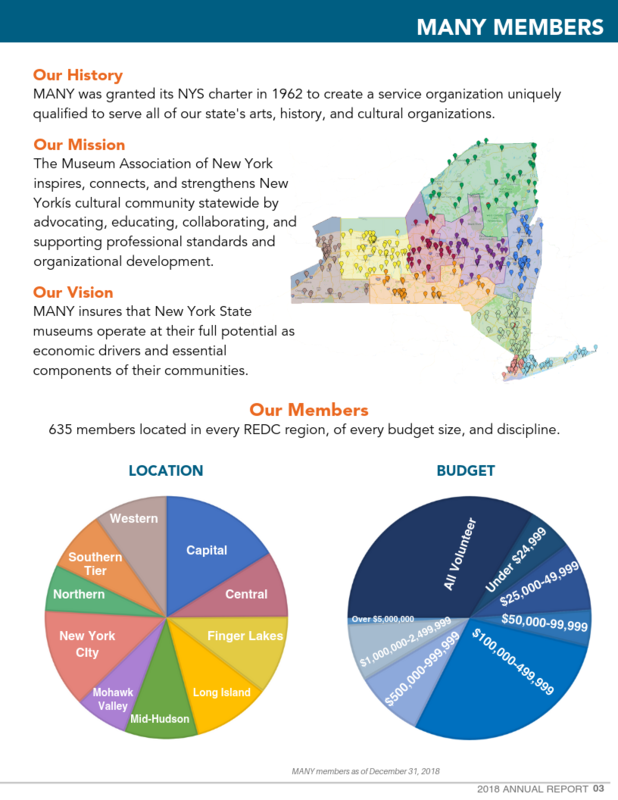 Although we have heard from more than 10% of our state’s museums, we want to include as many of you as possible. Please know that your voice matters, and your data counts, click here and take the survey! Your legislators, members of the Board of Regents, and the Governor’s office are waiting to learn about The State of New York State Museums.